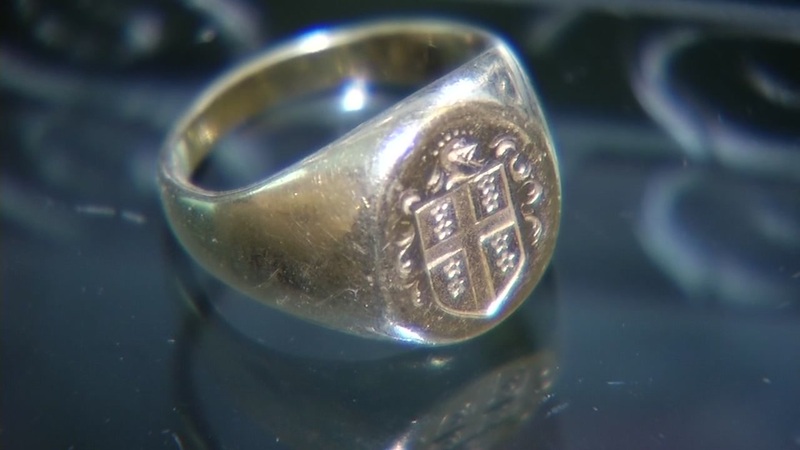 A ring stolen from a fallen soldier's mausoleum in Contra Costa County is seen in this undated image. WALNUT CREEK, Calif. (KGO) -- The East Bay mother of a soldier killed in combat in Afghanistan is mourning again after a cherished ring was stolen from his mausoleum in Contra Costa County. Army Specialist Sean Langevin's remains contained the 14kt gold ring, which holds sentimental value to his mother, Roxane. When Roxane visited the mausoleum on Christmas Day, she discovered someone had stolen the ring from a display space. "For someone who served his country, sacrificed his life, I can't. It's unconscionable. It's unvelievable," she said. The ring has the family crest engraved on it, and was a gift from Sean's father before he was deployed.